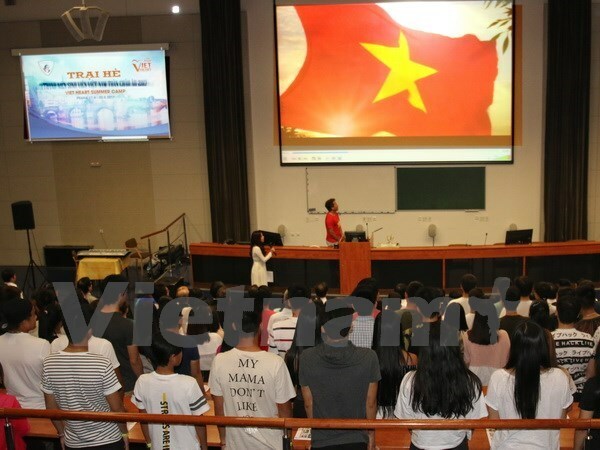 Prague (VNA) – The third camp for Vietnamese youths and students in Europe (SiviTa Europa) kicked off in Prague, the Czech Republic, on August 17, attracting 300 delegates from 12 European nations and Vietnam. The four-day event aims to strengthen the solidarity and enhance the knowledge of the nation’s culture, history, geography, and language among Vietnamese youths and students in Europe. Addressing the opening ceremony, Le Quoc Phong, President of the Vietnam Students' Association (VSA) said the HCM Communist Youth Union and the VSA have continuously supported the movements of overseas Vietnamese students. The two organisations want to promote the activities and structures of their chapters abroad to create a dynamic environment for Vietnamese youths in Europe in general and worldwide in particular, contributing to preserving the Vietnamese culture, and promoting the image of the nation and the Vietnamese people. Numerous activities took place during the opening ceremony, including art performance, cultural exchanges and game shows. The Association of Vietnamese youths and students in the Czech Republic was welcomed as a member of the Vietnam Youth Federation at the event.